what are the Benefits of Trauma-Informed Yoga + Meditation? mounting evidence based research illustrates the impact of yoga practice on emotional health for the communities we serve. 'The effects of Yoga and Meditation in the Prison population,' a study at the University of Oxford identified yoga as a purposeful activity that shows humanity. Students showed reduced stress and psychological distress, improved impulse control, mood, concentration, and decision making. 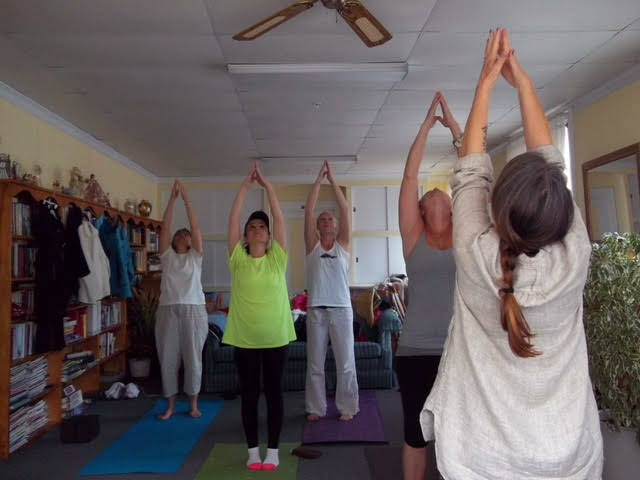 Students in the yoga program were more likely to stick with and succeed at education and employment both in the correctional facility and upon release. The study also noted a potential cost savings as a result of reduced violence attributed to increased positive emotions. Yoga for the Treatment of Post-Traumatic Stress Disorder, Generalized Anxiety Disorder, Depression, and Substance Abuse: A Review of the Clinical Effectiveness and Guidelines, This study concluded significant improvements in general well-being and anxiety for patients. The yoga proved beneficial as an adjunct treatment for women undergoing outpatient detoxification treatment for heroin dependence, and the yoga treatment group experienced significant improvements in quality of life and mood states after 6 months of yoga. Mindfulness-Based Stress Reduction in Massachusetts Correctional Facilities conducted an extensive study of 1,350 prisoners and113 yoga classes. Improvements were found on self-report measures of hostility, self-esteem and mood. The study showed that regular practice of meditation helped individuals cultivate deep and long-lasting experiences of inner calm, well-being, self-worth and self-respect. Harvard Health Publishing's study 'Yoga for Anxiety and Depression' concluded that yoga practices can reduce the impact of exaggerated stress responses, help with anxiety, provide emotional regulation techniques, assist with relaxation, and can be a tool to combat depression. Yoga for the Treatment of Post-Traumatic Stress Disorder, Generalized Anxiety Disorder, Depression, and Substance Abuse - This study showed significant improvements in general well-being and anxiety for patients. The yoga proved beneficial as an adjunct treatment for women undergoing outpatient detoxification treatment for heroin dependence and the yoga treatment group experienced significant improvements in quality of life and mood states after 6 months of yoga. Stanford University concluded that medication and therapy only relieve PTSD symptoms in 50% of Veterans, while breathing exercises dramatically decreased PTSD and remained a year later, suggesting lasting impact. Yoga and Mental Health: How it helps depression and four other conditions - This study concluded that yoga teaches clients that they have control of their stress reaction and gives them a coping skill. Yoga provides tools to see their bodies as something they are working with, rather than against, and it provides tools on how to calm themselves down when distressed which can lead to lower incidence of drug and alcohol abuse, or other self-medicating behaviors.